Yep! It's almost on its way! Should be in just a few minutes, if not several seconds! Before our course software provider will send out your 5 Day Baby Signing course, you will want to confirm that we have the correct email address to send it to, and that we indeed have your permission to do so. (This sorta bites for us who reaaaaaaalllly wanna start this course like YESTERDAY, but this helps make sure that a person on naughty hijinks may have submitted your email or someone could have typed it in my accident, with their e-mail being just a letter or number shy of yours in comparison! So, point is, one never knows, so this confirmation system is to keep everyone's email safe and sound. Please check your e-mail. 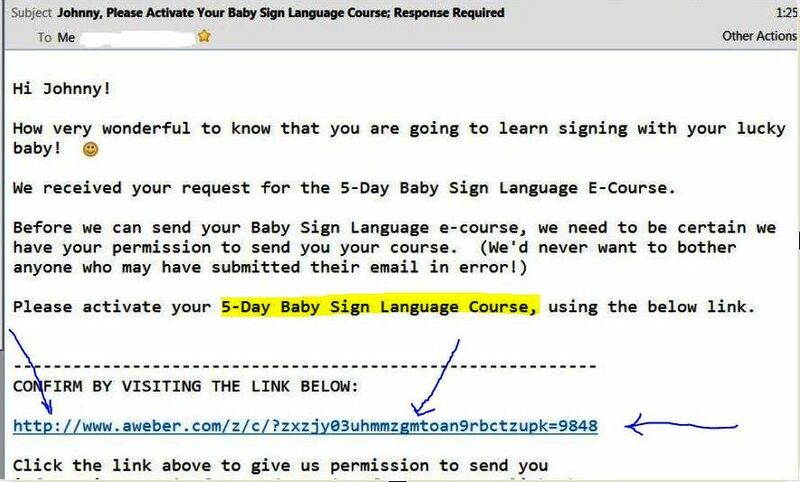 The Subject line of that message will say something like: Jenny, Please Activate Your Baby Sign Language Course; Response Required..
Once inside this message, you will see the confirmation link required to get your free course. You will need to click that confirmation link which talks to the software permssion system and all that other techie mumbojumbo... ;-) But by clicking that link, it will instantly activate your baby signing course! After you click that link, you will get another message confirming your confirmation, ha! Hope you enjoy the Baby Sign Language eCourse! Happy Signing! Wishing you the best always! Thank you again for signing up for our baby sign language course! I truly hope it's everything you need to get started. And of course, any and all feedback is welcome. Thank you again! Happy Signing! Ok, now remember to go confirm your course so you can get started immediately!